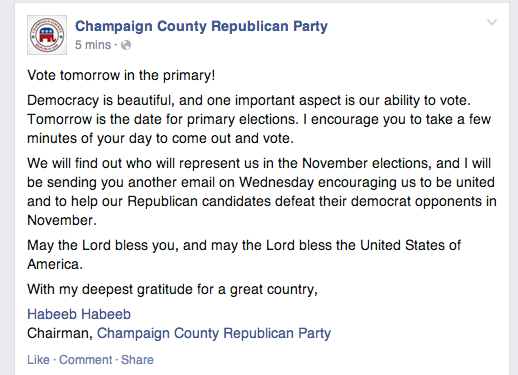 On their Facebook page, Habeeb Habeeb, the Chairman of the Champaign County Republican Party urges everyone to get out and vote. He points out tomorrow's primary election matters as much as November's. Let's get after it, folks! Vote tomorrow in the primary! Democracy is beautiful, and one important aspect is our ability to vote. Tomorrow is the date for primary elections. I encourage you to take a few minutes of your day to come out and vote. We will find out who will represent us in the November elections, and I will be sending you another email on Wednesday encouraging us to be united and to help our Republican candidates defeat their democrat opponents in November. May the Lord bless you, and may the Lord bless the United States of America.